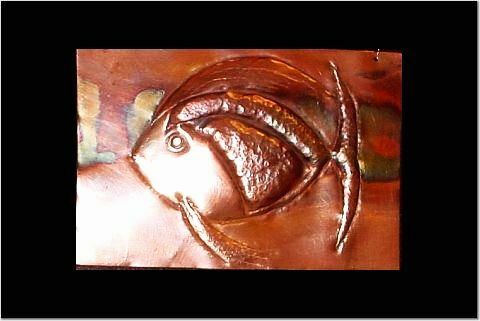 Copper repousse. Cut from a flat piece of copper. Hammered on an anvil. Piece hangs in a childs room. Approx. size 10x12. I love this one! I like your proficient software too... hammer and anvil! LOL! A very nice fish.One of your best artworks. Very creative, love the amazing detail to the fish!! Excellent texture, and colours.. really wonderful! !